The exceptional 7-inch screen is designed for reading books and magazines, watching movies, playing games, and more (see larger image). With integrated Google technology, the Galaxy Tab brings one-touch access to the popular Google mobile services millions use every day, including Google Search by voice, Google Maps with Street View, Gtalk, YouTube, Picasa, and contacts/calendar synchronization. And through Android Market, you'll get access to thousands of useful applications, widgets and fun games to download and install on your phone, with many more apps being added every day. 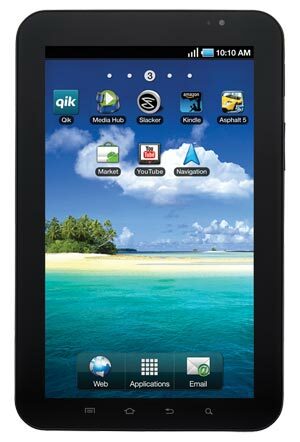 The Galaxy Tab offers full support for Adobe Flash Player 10.1 for accessing Flash-enabled websites, watching video and playing games, and with built-in support for ultra-fast Wireless-N Wi-Fi, the Galaxy Tab's portable screen is ideal for watching the latest movies and entertainment. It's outfitted with a rear-facing camera for photo capture and sharing as well as a front-facing camera for video chat using the pre-loaded Qik voice and video app. The Galaxy Tab is also pre-loaded with the Kindle for Android app for reading your Kindle books on the go, Slacker Radio for listening to free, streaming personalized radio, and the Asphalt 5 HD driving game (learn more about these apps below). Designed to fit in one hand, typing messages or notes is simple and easy with the Galaxy Tab's virtual QWERTY keyboard with Swype technology, which allows you to input text faster and in a more intuitive way with one continuous finger motion across the screen keyboard. Other features include Bluetooth 3.0 wireless connectivity for hands-free devices and stereo music streaming, microSD memory expansion, HDMI video output (via optional dock), and up to 8 hours of battery power. Perfectly sized for your hand (see larger image). Offering one-stop shopping for all your updates, the Samsung Social Hub all your social networking services, messages, personal and business e-mail, calendars and contacts. It's built around Messaging and Contacts, both of which initiate the sending and receiving of information--whether it is e-mail, instant messaging, social network updates or SMS messages. Additionally, calendar information from portal calendars, such as Google Calendar, and social networking services are displayed together in one calendar with two-way synchronization. The familiar text messaging experience is enhanced with group messaging and "reply all" functionality for up to 10 contacts, a threaded conversations format, a consolidated inbox, and enhanced multi-media display. Powered by the Android operating system (version 2.2) with deep integration of Google services, access to thousands of apps via the Android Market, and support for Adobe Flash 10.1. Swype input system allows you to input text faster and easier by gliding your finger around the keyboard, moving from letter to letter in one continuous motion. The Swype technology then calculates what word you're intending to type (learn more below). Next-generation Bluetooth 3.0 connectivity provides faster throughput while minimizing on power requirements. It's compatible with new Bluetooth 3.0-enabled devices as well as backward compatible with older Bluetooth-enabled peripherals such as headsets and printers. It includes profiles for communication headset, hands-free car kits, and the A2DP Bluetooth profile--enabling you to wirelessly stream your music to a pair of compatible Bluetooth stereo headphones or speaker dock. 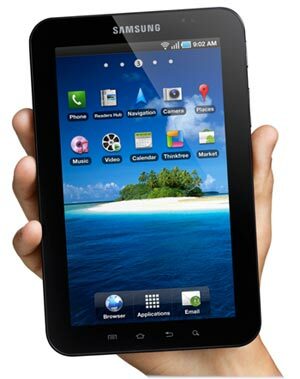 The Samsung Galaxy Tab weighs 13.4 ounces and measures 7.48 x 4.74 x 0.47 inches. Its 4000 mAh lithium-ion battery is rated at up to 7 hours of battery life. It runs on the 850/900/1800/1900 MHz GSM/GPRS/EDGE frequencies. Kindle for Android: Pre-installed on the Galaxy Tab, the Kindle for Android application lets you shop for hundreds of thousands of books in the Kindle Store, including New York Times Best Sellers and new releases from $9.99. Use Amazon's Whispersync technology to automatically synchronize your last page read, bookmarks, annotations, and more across your various devices --- including Kindle, Kindle DX, PC, Mac, iPad, iPhone, iPod touch, BlackBerry and Android phones. Slacker Radio: With millions of songs from thousands of artists, Slacker is the best way to discover new artists and hear your favorite music. Listening to Slacker is as easy as selecting one of over 120 DJ-programmed genre stations or searching for your favorite artist or song. As you listen, you can tell Slacker what you like and don't like with the click of a button. Get the ultimate in music discovery while you listen with detailed artist biographies, in-depth album reviews and more. Upgrade to Slacker Radio Plus for unlimited skips, ad-free listening, complete song lyrics and more for only $3.99/month.